More than half of American cats are overweight, and those extra pounds can lead to a variety of health problems, including diabetes, skeletal stress, and a shortened life span. 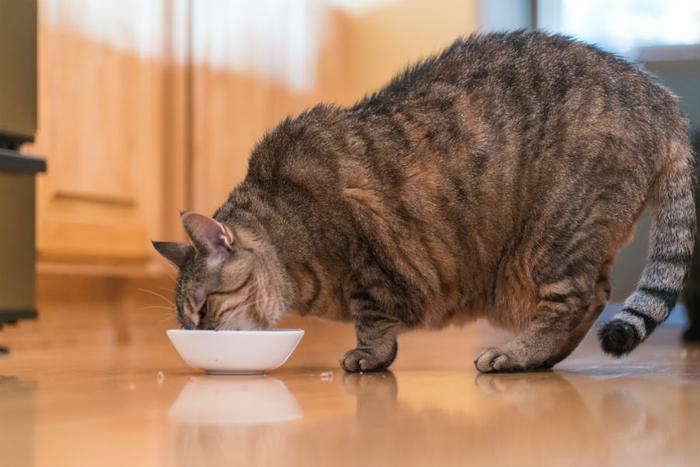 However, in order to help an overweight cat achieve weight loss, owners must continue to reduce the feline’s food intake even as they lose weight. That’s because a fat cat will stay a lazy cat even after it loses weight, researchers say. A recent study from the University of Illinois found that in order for cats to achieve weight loss, a continual reduction of food intake had to be implemented. “That’s a key point. When we go on a diet ourselves, we might lose a lot of weight in the first few weeks and then hit a roadblock. Same with these animals,” said lead author Kelly Swanson. The eight cats in the study were all neutered males, which the researchers noted tend to be lazy. For 18 weeks, the cats were kept together while having their activity level and food intake monitored. The results showed that the animals needed a lot of time to reach their weight goals. “It turns out you have to keep reducing their food intake because they're not very active. It takes a long time," Swanson said. The researchers targeted a safe level of weight loss -- 1.5 percent body weight loss per week, which falls in line with the range (0.5-2 percent per week) suggested by the American Animal Hospital Association. This rate of weight loss is enough to notice a change, but not enough to cause health problems as a result of losing weight too quickly. Each cat's food intake was reduced at the beginning of weeks two through eight and then kept constant for the remaining 10 weeks. To achieve 1.5 percent loss, the researchers had to keep cutting the felines’ food intake. First by 20 percent compared to a maintenance diet, then further reducing food intake every week. “We got really low, but we were monitoring them so they were healthy,” Swanson said. As the group of cats slimmed down, their voluntary physical activity “didn’t change much.” Swanson said that toward the end of the study, they were “becoming a little more active, but not statistically." Swanson added that pet owners sometimes don’t even want to admit that their pets are overweight. "We've done some clinical studies in dogs showing that misconception. If you have a veterinarian do a body conditioning assessment (BCS) of a pet and then have an owner do it, the owner will almost always underestimate the BCS,” he said, adding that it’s crucial for owners to acknowledge the weight status of their pets. "The second thing that needs to change is the owner's behavior: getting them to reduce food intake to maintain a healthy BCS. Food companies recognize that many owners feed too much, so they're trying to formulate their diets so it's easier for the animals to maintain or lose weight even if an owner overfeeds," he said. To help a cat achieve weight loss, Swanson recommends encouraging exercise as much as possible by playing with them and placing food bowls farther away from favorite resting spots. The full study has been published in the American Journal of Veterinary Research.